Amigo Pancho 5 is the 5th part of this interesting puzzle series, developed by Qaibo Games. Welcome back to the exciting series Amigo Pancho. While watching television, Pancho saw the news with the words "Save the Arctic". Pancho wants to go to Arctic but he does not have money. Pancho has only two blue balloons and he decides to use them to fly to the Arctic. However, there are many dangers awaiting the Arctic. Can you help Pancho fly safely to Arctic? Amigo Pancho 5 has 31 levels, with each level being a challenge for you. In each level, you will face the same danger as spikes, evil bats, cactuses that fire continuously. However, you can click to remove objects, drag the object and create a safe path for Pancho. Use these special abilities to help Pancho overcome the dangers and fly to Arctic safely. In some level, you will see yellow stars. Collect these stars and you will have a lot of points. But the yellow stars are always near the danger and you need to control Pancho wisely when collecting them. If you get stuck, you can click the Walkthrough button to see the tutorial. With cute music and simple graphics, I believe you will like Amigo Pancho 5. Good luck and have fun! Use mouse to remove objects and help Pancho complete his mission. Use the wind blowers to help Pancho dodge dangerous obstacles. Amigo Pancho 5 Unblocked is the 5th part of this interesting puzzle series and you can play it for free at freegames66. With freegames66, you have a friendly interface to play Amigo Pancho 5 Unblocked. In addition, you can access this website from anywhere and anytime, because it's a reliable site and it works 24/7. 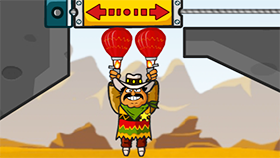 Now, enter Amigo Pancho 5 Unblocked, click to remove the objects and help Pancho complete his mission. Play now!